WHO: Kenji Mizoguchi directed this; it was not the first film of his shown in the West, but it was the first to win the top prize at a major European film festival: Venice's Golden Lion. To this day it's the film that most frequently serves as the introduction to his filmmaking for European and North American cinephiles. WHAT: The film's full name in Japanese is transliterated as Ugetsu Monogatari (generally translated as "Tales of Moonlight and Rain"). It's a film which contains multitudes: it's a 16th-century period drama, an anti-war critique, a ghost story, a tale of seduction, a samurai adventure (though not at all an action movie) and, like virtually all of the films made by Mizoguchi, it illustrates the sorrowful consequences of a patriarchal society. The story follows a pair of peasants who try to capitalize on wartime upheaval by bringing a load of goods to the bustling city market. Tempted by the promises of wealth and glory, they become so distracted from their goal of providing security for their families that their ultimate reunification is thrown into doubt. Everything is put across through beautiful black and white photography by cinematographer Kazuo Miyagawa, who also shot Rashomon and Yojimbo for Akira Kurosawa, Floating Weeds for Yasujiro Ozu, and a sizeable portion of the filmographies of Kon Ichikawa, Masahiro Shinoda, and Mizoguchi. WHERE/WHEN: Tonight only at the Pacific Film Archive at 7PM. 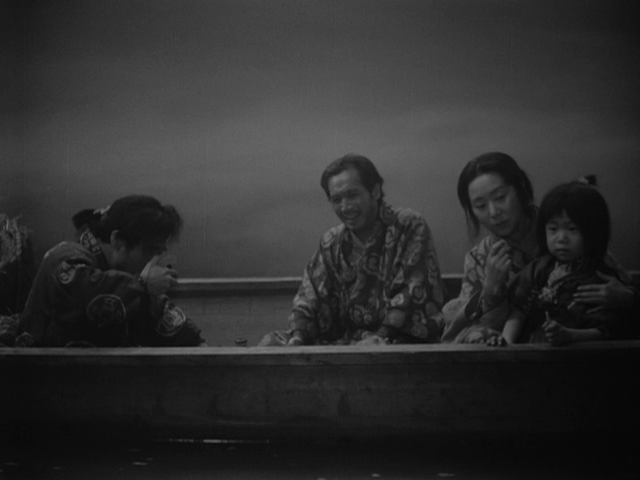 HOW: The entire Mizoguchi series at the PFA will screen via 35mm prints. The Ugetsu print comes from the PFA's own collection.